Over half the water stored in the lake is allocated for environmental flows and the dam consents prescribe a minimum flow regime for the Opihi River at Pleasant Point. 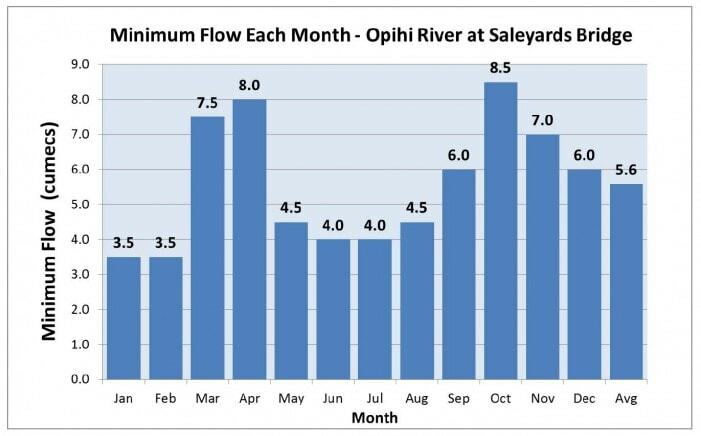 The minimum flow varies for each month of the year (see graph below), with higher flows to support important phases in the fish breeding cycle in the river. If you have an irrigation device that requires a manual shut off, you no longer have to get up at midnight to turn off your irrigator. Instead, you can continue to irrigate until 9 am even though technically your water take is on restriction from midnight. This enables you to safely get out and turn off the device anytime between midnight and 9 am. When the irrigation restriction is removed, you cannot turn the device on at midnight if you did not cease at midnight. For example, if you turned your device off at 6am on a restriction day, you have to wait until 6am on a non-restriction day to turn it on. For rivers whose flow is gauged or assessed by staff in the field at 5pm. Below you will find further details about what each status means and ECan’s approach for determining allocation limits. A Red Zone is where ECan’s assessment shows that the total amount of groundwater currently allocated exceeds the allocation limit. A Yellow Zone is where ECan’s assessment shows that the total amount of groundwater currently allocated is 80% of the allocation limit. A White Zone is where ECan’s assessment shows that the total amount of groundwater currently allocated is less than 80% of the allocation limit.